The Tridarka Raider has been designed in a collaboration between Chief (aka Steve Isaac of WaterTribe, Inc.), and Wizard (aka Matt Layden) to fulfill Chief's wish list for the ultimate fast, light coastal camp-cruiser to compete in events such as the WaterTribe Everglades Challenge, Ultimate Florida Challenge, and the Dry Tortugas Challenge as well as for long unsupported solo expeditions. The intent is to create a safe, stable and forgiving platform that will allow a singlehanded or shorthanded crew to make fast coastal passages in any reasonable weather without major exhaustion, exposure or worry. Easily trailerable on a light rig behind a 4-cylinder car. A constant adrenaline ride that leaves you worn out after a few hours. 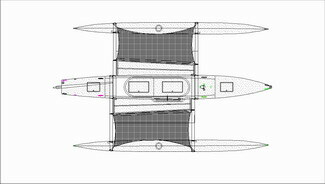 Vaka Beam at Deck: 2'-4 1/2"
Vaka Beam at DWL: 1'-8"
Design Draft Board Up: 8 1/2"
Design Draft Board Down: 3'-8"
The target of 350 lbs rigged weight is possible with careful and weight- conscious construction, but it will not be easy or cheap. The indicated construction (all skin parts of 4mm okume plywood sheathed with high-tech fabrics and epoxy inside & out) is the most reasonable way to make a durable boat anywhere close to this weight. Foam cored composite would need to have very thin skins and would be too fragile for this boat's mission. Canoe-style composite skinned strip planking would be great but is felt to be too laborious, and too hard to get a nice finish, for the time frame of this project. Using 6mm (1/4") okume plywood throughout, and omitting the composite skins, would be much less labor and somewhat less expensive. It would be at least as structurally rigid and nearly as impact resistant as the specified construction, but would be heavier by the time you add in seam taping, fiberglassing the outside and epoxy coating the inside, and wouldn't be as resistant to abrasion and consequent water soakage. Some builders may prefer this method if weight is not a big factor for their use; they have my blessing to develop their own spec and detailing for it if desired. It will be critical to mind weight in every phase of the construction and outfitting. Using just enough epoxy, squeegeeing off excess, minimizing or omitting fill coats on interior surfaces and minimizing filler and paint on the outside will all be necessary. Please trust that the spec is strong enough; it is meant for rough use. Try to avoid the temptation to add extra structure or extra layers of reinforcing 'just to make sure' (the designed structure is meant to be flexible in many areas; don't try to resist it). Good quality materials are assumed in the spec. Using knotty shop-grade wood for akas or deck beams is asking for trouble. Less expensive plywood will be heavier, there's no way around it. Similarly, resist the temptation to add a lot of extra internal fittings, deck hardware and rigging. Keep it simple to keep it light, it won't kill you to luff up for a few seconds while you walk forward to adjust the outhaul or boom vang; every line doesn't need to be led aft to the helm station. Other Polynesian part names that are less common in western usage aren't used, with no particular attempt at consistency, sorry if this is confusing. Standard US English nautical terminology is used otherwise; yes it is obscure and can be confusing to the newbie just like jargon in any other field. But like other jargon the words are used for a reason: ('Words mean things,' dang, where did I hear that?) they all have very precise meanings which should be respected. One word serves where it would otherwise take a paragraph. Invest in a nautical dictionary, or just google unfamiliar words if it's a problem.